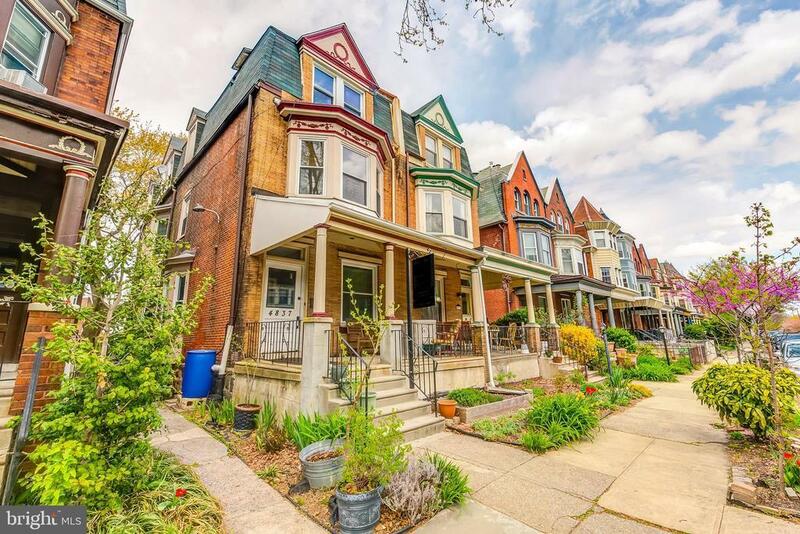 This sunny, rehabbed West Philly twin in the Garden Court neighborhood of University City is packed full of great space that works equally well as 2 private apartments, or as co-living space shared with friends & relatives. The big bilevel 1st/2nd floor apartment has 3 bedrooms and a bath, a wide-open living/dining room, and a kitchen large enough for several cooks to share. The third floor apartment has 2 bedrooms and a bath plus a living room, kitchen and separate dining space topped with a skylight. If youre an owner-occupant living in the bilevel apartment, you can open the 2nd floor hall door for access to the stairs to the 3rd floor apartment and share the house with an au pair or inlaws. Or, you can keep that door locked for complete privacy, and rent the 3rd floor apartment to help pay your mortgage - theres a private entrance at the rear of the house for that upper unit, and the current rent is $1300+ separate utilities. The first two floors will be vacant as of July 15th. The 3rd floor unit can be vacant on July 1st, though if youre looking for rental income, the current tenant would like to stay.